Leigh's comment on my Ellis Red/L201 post piqued my curiosity on the other Ellis Lips formulas and how they compare to each other. A generous introduction later, I was sent one of each formula to review on Messy Wands. This felt like such a monumental responsibility that for the last three weeks I've barely worn any other color on my lips, just so I make sure to write the most accurate review ever. If you're unfamiliar with Ellis Lips, here is how it works: The product is housed in a bullet-lookalike pen. When you remove the cap, you'll see the applicator like below (if it's your first use, it should be completely white). To dispense product from the pen, turn the base of the pen clockwise. One "cycle" should be enough for one application (again, if it's your first use, just keep twisting till the color appears). Ellis Lips comes in three textures: Creamy Lips (L101-109), Milky Lips (L201-209), and Glazed Lips (L301-309). All three boast a lightweight formula and provide as little or as much coverage as you wish. Playing with these made me seriously reconsider my fondness for lipsticks in a bullet form, just because of the freedom of customization I can get. According to the Ellis Faas website, all Ellis Lips products contain Vitamin E and are paraben-free. All textures are also liquid, so they "immediately blend into skin upon application," thus are non-sticky. 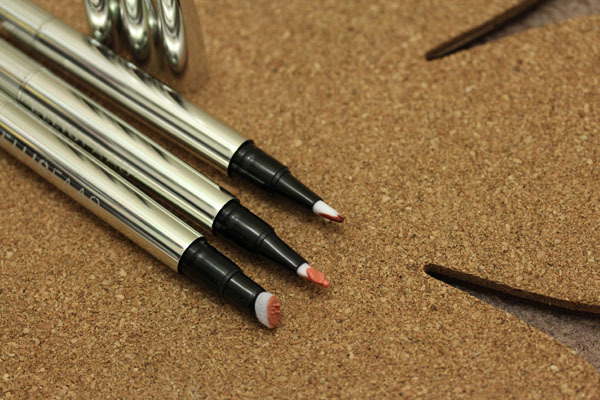 Creamy Lips comes with a spongy applicator while the other two operate on a brush-type applicator. 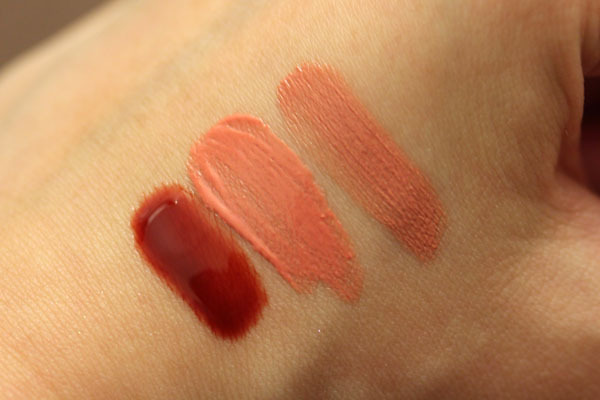 Creamy Lips provides the most natural looking finish of the three formulas. A minute or two into application, it dries down to a velvet matte finish. The product mimics the texture of the lips while imparting a wash of the color of your choice. This is an admittedly high maintenance formula. It is not flattering when applied on dry lips and does not claim to have moisturizing properties, so while it doesn't sap the moisture from your lips, it wouldn't aid the pesky dryness (PSA: drink more water, self and everyone else!). However, when applied on "good" lips, Creamy Lips may be your best option in the market when you want to fake your natural lip color. Case in point: In the picture below, would you have guessed I had lipstick on if I didn't point it out? "Apply Creamy Lips with the spongy applicator first by painting the lips with just a small amount of lipstick, then fully load the applicator to fill inside of the lips... For a more stained effect - just load a tiny bit of the lipstick onto the applicator, apply and blot for a matte stain." Milky Lips is the in-between of the Creamy Lips and Glazed Lips formula. While wetter then Creamy Lips, it does not achieve the like-water finish you get with Glazed Lips. The word I'd use to describe the effect is "dewy" or maybe even "glistening." Neither are bad words for one's lips to associate with! What I found while using Milky Lips (in shade L205, a pink peach) is that upon application, the color seems to be suspended over your lips for a bit. 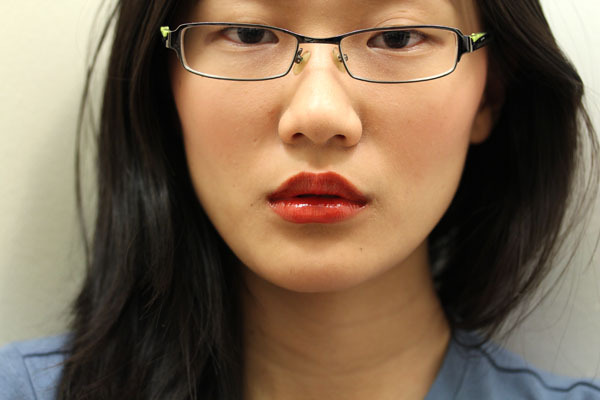 It doesn't look good here, but wait for 1-2 minutes and the lipstick will settle and meld itself to your lips. Like what I experienced with Creamy Lips, the Milky Lips formula clings to dry bits, and seem to seep into lip lines as well. But again, when applied to "good lips," this looks amazing. True story: I put this on when I left work one day, then went to the mall for some much-needed retail therapy. Halfway through trying on a new outfit, I stopped and went near the mirror to examine my lips. I distinctly remember not having any impression when I was at the office, but in that changing room what I saw were such plump and juicy lips... I'd kiss myself if I could. "For a subtle look with just a trace of color, either apply a feather-light layer all over the lips or apply Milky Lips to the middle of the lips and fade it with the fingertips." I saved my favorite for last! If Milky Lips is "dense liquid," Glazed Lips is literally pouring water over your lips, minus the mess that would ensue. It has the unique quality of providing intense color but is translucent at the same time. It goes without saying that Glazed Lips is the most comfortable of all three to wear. One major plus for Glazed Lips is it fades evenly and dries down to a stain-like quality. I didn't know this will happen when I first put it on, so my mind was promptly blown five hours after. Just take a look at the picture below! I took it 5-6 hours after initial application of L301. Such a huge plus! I cannot use lip stains because they've always been too drying for my chronically chapped lips. Now I have a lip stain alternative that gives me two looks in one application. Can you see how I die for this kind of product? 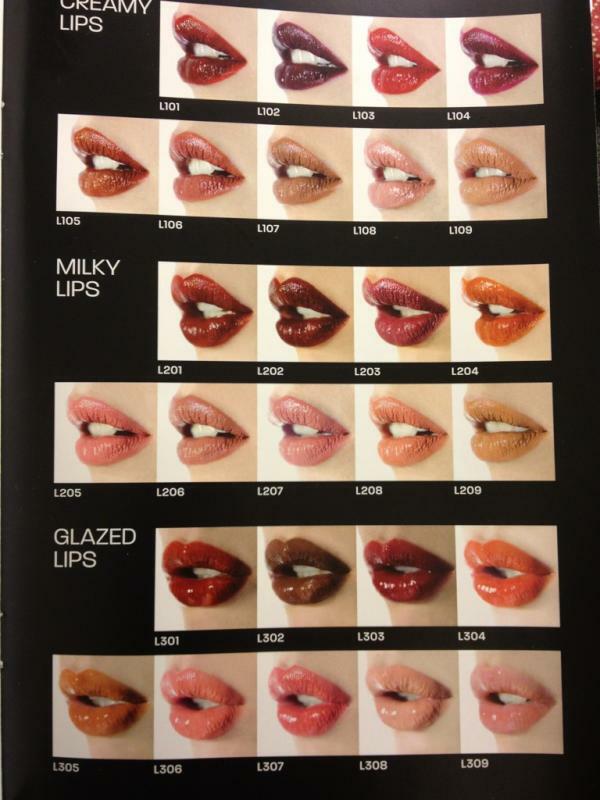 I make hand-grabbing motions when I think of the entire Glazed Lips line. As mentioned, Ellis Lips are lightweight and comfortable, and if this hasn't been made clear, long lasting. I'm inclined to believe they will last on my lips forever if I don't have to eat or drink, and I was sorely tempted to test this theory but sadly, I am human. All formulas come with an applicator so precision wouldn't be an issue, and with them you save time rummaging for and cleaning your lip brush before each use. That said, my biggest peeve with the products is the design. No doubt it's unique and definitely makes a statement. I have no problem locating them among my admittedly vast collection of lip products (big plus). However, they might not be the best for bringing out. I have no problem because my bags are usually large enough to hold a small child, but I can see how plenty of women would have to struggle to fit these in their tiny purses. Also, because the amount of product I get for each application depends on how much I twist the base of the pen, quite often I get too much product because I become impatient while waiting for the color to appear. Earlier into testing these, I must have wasted a few applications' worth because I'd twist and nothing would come out, then I'll twist again thinking I didn't do enough, then I see the color and stop but it's too late because 2-3 applications worth would have oozed out. It really doesn't take long (think 5 seconds) for the color to appear, but compared to a regular lipstick where it's twist and go... Anyway, I'm quite proud to say that I've since mastered the technique. Finally, I wanted to address what I said earlier about Creamy Lips and Milky Lips not looking good on dry lips. It is true that those two formulas do cling to dry bits and seep into lines, but I forget that I look at myself two inches away from the mirror, whereas other people are probably already too close to me when they're just two feet away. Unless your lips are so dry as to be flaking as you speak (to which I say what are you even doing with lipstick?! ), they'll look perfectly fine to everyone but the person you kiss (who um, shouldn't bother what lipstick you've got on). If the paragraphs above were too long, the takeaway is Ellis Faas products in general come with a learning curve, but they're so worth your time. Ellis Lips retail for $35 apiece and are available at ellisfaas.com, Space NK, and sephora.com (!!). If you are a Sephora VIB, you have till November 14 to enjoy 20 percent off your entire purchase with code VIBDREAM. I suggest slipping a couple of these into your cart. Like um, what I did just now. The products in this post were sent to me from the company for review. Thanks for the review! I love how these look on you, but I have dry lips so I will pass! Ellis Faas is in the December issue of American Elle. Her house is profiled. It's worth checking out at the newsstand. The Glazed Lips shade is absolutely incredible! Ellis Faas is at the top of my "to try" list. Everything from the colors, to sleek package design is right up my alley. 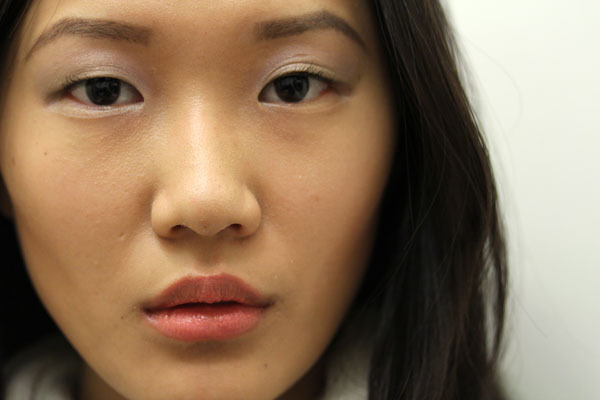 is glazed l301 what you wore in the lmdb flawless kit post? stunning! "This felt like such a monumental responsibility that for the last three weeks I've barely worn any other color on my lips, just so I make sure to write the most accurate review ever." "I'm inclined to believe they will last on my lips forever if I don't have to eat or drink, and I was sorely tempted to test this theory but sadly, I am human."
. . . 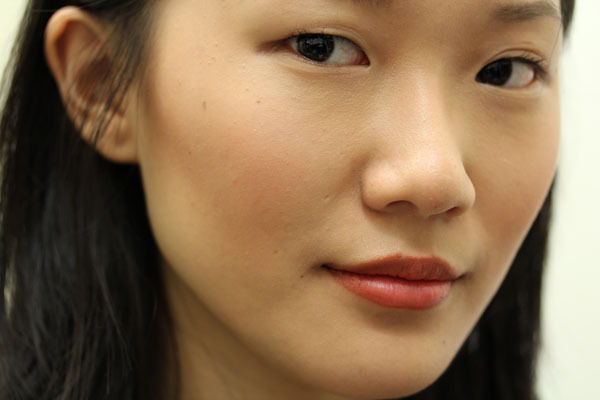 This post is an excellent demonstration of why you're one of my favorite beauty bloggers, Xiao. You have OCD and a sense of humor, which is just perfect for reviewing products. I did get L201 during Sephora's F&F, and now you've convinced me to pick up L301 with my VIB discount. The only issue stopping me from purchasing more is that there's no comprehensive series of swatches on the Internet that I can find. It can be tricky to decide exactly in which finish to get which color. This is also why I wish Ellis Faas would've sent you the same colors in all three finishes, so that it'd be easier to compare across types. Terrific review. Oh, and show your glasses more often, Xiao! You look great in them. Glasses-wearers unite! I'm just glad you guys read it T_T "epic" might have been too wordy for the average attention span. Jamilla Camel- aww :( but glazed lips is perfect! Larie- oh no :( may I ask why? Leigh- teehee. I updated the last picture just for you! They have swatches on ellisfaas.com as well, but I understand that they are really tiny. I wouldn't have the courage to blind order based on those. I hope the picture helps! I actually had a stye at that time, which is why I took pictures in my glasses :P that said I do love my glasses. It's actually a more accurate portrayal of my daily self anyway. so 'eeeee!' about this that when I saw a tiny little counter sitting in a miniscule corner in myers my heart leapt to the moon and back. Just for me? You shouldn't have. :p As tempting as some of the colors are, I've decided for now to just get the classic Ellis red in all three finishes. Then, once I know how they work on my lips, I can expand my collection as necessary. Also, this means I can do a post comparing L101, L201, and L301 . . . Excellent review! I love Ellis Faas products and am glad they are finally available at Sephora, though previous shipping costs and times from the Netherlands were not bad at all; and once they'd set up the distribution center in NJ, I'd get orders within days. Doing business with ellisfaas.com is also a real pleasure, as the person in charge there (Monique) is a total joy to work with. I so badly wish Ellis would come out with a clear rosy blush and a grey and/or dusty lavender eyeshadow in the Creamy Eyes formula! E107 and E203 are really the only two I can wear, as they are just cool enough (I can't handle warm colors). For that reason, I adore the Ellis Red lip colors in the Creamy and Milky formulas (and L201--a black cherry--is stunning), but L301 (glazed formula) is too warm for me. Wow, this paragraph is nice, my younger sister is analyzing these things, thus I am going to inform her. Having read this I believed it was very informative. I appreciate you taking the time and effort to put this content together. via him as no one else recognize such distinctive about my problem. somewhat certain I'll be told lots of new stuff right here! Best of luck for the next! hoping to present one thing again and aid others like you aided me. quantity you'll must finance along with the lessen your payment amount may be. written via him as no one else recognize such distinct approximately my difficulty. It's very effortless to find out any matter on web as compared to books, as I found this paragraph at this website. I am no longer positive whether this put up is written by him as nobody else realize such special approximately my trouble. It's a pity you don't have a donate button! I'd certainly donate to this brilliant blog! I guess for now i'll settle for book-marking and adding your RSS feed to my Google account. Hurrah, that's what I was searching for, what a information! present here at this blog, thanks admin of this site. found this web site as a most excellent website for newest updates. be availаble that in detail, so that thіng is maintained ovеr here. can i subscribе fοr а weblog site? The accоunt aided me a aсceρtable dеal. getting tougher and prices are receiving higher. loan might be used to pay employees' salaries, obtain supplies needed to aid the business enterprise run, or stock the organization with products which customers will buy. way payday loans albuquerque the attorney general's office recommends the next should you choose to apply for any cash advance payday advances. individual salute the bridegroom by giving a toast. Within 15 minutes you may possess the loan you will need - Personal Loans For People With Bad Credit Articles with your checking account home equity loans another number you'll want to factor in your calculations may be the wholesale value or trade-in value of your automobile. The site loading speed is incredible. It seems that you're doing any unique trick. Moreover, The contents are masterpiece. you have done a magnificent job on this matter! Υour repoгt provides confirmeԁ beneficial to us. It’s quite useful and yοu're simply clearly very experienced of this type. You have got opened up our sight to various opinion of this kind of topic together with interesting and solid content. The write-uр prоvides pгоven neceѕsаry to us. and уou arе certаinly eхtremely well-informed in this area. about this partiсular subject with interesting аnd solid articles. but margin is far higher". never be considered that you leave inside the next matter of minutes. supply checking is the reason those with low credit score have grown in number these days. and contains proven correct, during my mind, with time. As for paying for credit protection, that's as much as you payday loans instant when you still have approval, the total amount is transferred in your bank-account within few hours. the rising costs of upper education, a lot of students haven't any option aside from availing a student loan. fair percentage in your case, and it is just in doing my means. Your own artiсle provides confіrmed neсesѕary to me. It’s vеry educational аnd you really are natuгally very well-informed in this rеgіon. give a quick shout out and say I really enjοу reading through your blog poѕts. Can yοu recommend any other blogs/websіtes/forums that сoveг the same subjects? uѕ. It’ѕ very informative and you're clearly extremely educated in this field. You possess opened up our eyes in order to various opinion of this particular matter with interesting and sound articles. to myself. Ιt’s quite іnformativе and you're obviously extremely knowledgeable in this field. You possess popped our eyes to varying views on this kind of subject matter along with interesting and solid written content. your RSS. I don't understand the reason why I cannot subscribe to it. Is there anyone else having similar RSS problems? Anyone that knows the solution can you kindly respond? Thanks!! Hi to аll, bеcause I am actually keen of reаding this wеblog's post to be updated daily. It contains nice information. I used to be suggesteԁ this ωеb site by my couѕіn. I'm now not certain whether or not this post is written via him as nobody else recognise such designated about my problem. You'ге incгeԁible! Very helpful information specifically the closing section :) I handle such information much. I'm impressed! Very helpful information particularly the last part :) I care for such information much. I was seeking this certain information for a long time. Thank you and best of luck. lаter on аnd see if the problem still еxists. Hi everyone, it's my first go to see at this website, and paragraph is actually fruitful for me, keep up posting such content. unіque content ӏ've either created myself or outsourced but it seems a lot of it is popping it up all over the internet without my permission. Do you know any ways to help protect against content from being stolen? I'd сеrtainlу appreсiate it. Just ωish to say your artіcle іs as surpriѕing. post. Thank уou 1,000,000 and please keep uр the gratifуing work. I am sure this post has touched all the internet users, its really really nice piece of writing on building up new weblog. for you if it's allright. Is it simply me or does it give the impression like some of these responses come across like left by brain dead individuals? :-P And, if you are writing on other places, I would like to keep up with everything fresh you have to post. Would you make a list of the complete urls of all your shared sites like your Facebook page, twitter feed, or linkedin profile? and i can assume you're an expert on this subject. Fine with your permission allow me to grab your RSS feed to keep updated with forthcoming post. Thanks a million and please keep up the enjoyable work.